More than a dozen scientific studies have discovered a link between using talcum powder products and developing life-threatening ovarian cancer. In fact, a recent study showed that women who used talcum powder products consistently were 33 percent more likely to be diagnosed with ovarian cancer. 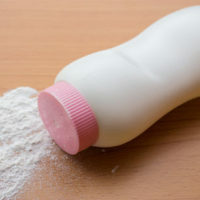 Researchers found that ovarian tumors had talc particles embedded in them. In 1982, another study discovered that women who used talc powder products during ovulation were at a 92 percent increased risk of being diagnosed with ovarian cancer. If you or a family member was diagnosed with ovarian cancer after using talc powder products for years, now is time to take legal action to hold the manufacturer accountable for selling a dangerous product to consumers without proper warnings. Cost of Medical Treatment – this includes all hospital bills, chemotherapy treatments, prescription medicines, and other treatments associated with the cancer diagnosis. Lost Income – If you are diagnosed with ovarian cancer, you will likely need to undergo a round of chemotherapy and radiation treatment. This often results in loss of energy to the point where you will need to take time off of work. You can get compensated for this lost income. Pain, Suffering and Emotional Anguish – you can pursue compensation for the mental and emotional trauma associated with a cancer diagnosis. The prospect of filing a lawsuit against a massive corporation like Johnson & Johnson can be quite intimidating and overwhelming. You may feel like the decks are stacked against you. An lawyer can help. You may be concerned about hiring an lawyer out of fear of being hit with a large retainer fee or having to pay massive hourly legal costs. This is not the case with product liability lawyers since we operate on a contingency-fee basis. This means we only get paid when your case is resolved, either through settlement or verdict. This means hiring a lawyer is a low-risk, high-reward proposition. The Nashville product liability lawyers at Calhoun Law, PLC are ready to assist you and your family through this tough time, especially when you are probably dealing with the shock and trauma of being diagnosed with ovarian cancer. We understand the complexities of the product liability claims process in Nashville. We have years of experience handling these types of cases and will work tirelessly to get the compensation you are owed. Contact us today for a free, confidential consultation.